MR: When did you start playing erhu? What attracted you to the instrument? 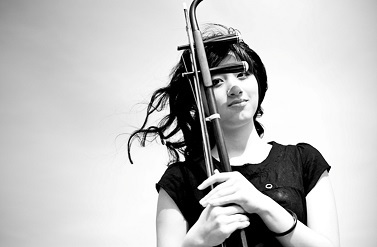 AZ: I started learning Erhu when I first entered Shenzhen art school in grade 4. My first instrument is actually the guzheng (a zither instrument), but as my teacher Lei Zhang recognized my musicality on the Guzheng he promptly asked if I would like to become his pupil and learn erhu. During my studies with Lei Zhang, I was always inspired by his music and the sweet tone that he can achieve from this simple looking instrument. The soulfulness of erhu takes away my feelings and emotions with the vibrations of the strings. MR: Who are your erhu-heros? AZ: My teacher Lei Zhang is my hero for sure. He has not only taught me how to play erhu but he also taught me how to bea good person. Music teaches a person patience and kindness. You will have to be able to inspire yourself before you can inspire others with your music. You will have to be persistent if you want to make good music. Aside from my teacher, I listen to a lot of Mingyuan Liu’s Recordings. They are so fun to listen to because of the variety of ornamentations. MR: What contemporary pieces for erhu have you played? AZ: Most recently I have premiered some contemporary works written for erhu and other instruments by University of Toronto Composers such as Roydon Tse, Tse Yueng Ho, Chen Ke, Lin Yuting, and Adrian Ling. Some notable new works are Chan Ka Nin’s Double Happiness and Alice Ho’s Four Seasons. In 2014, I also commissioned a solo erhu piece, Wind Chaser, by Matthew Van Driel. MR: When it comes to music for the erhu, is there some particular style or type of music that you find yourself attracted to or that you wish to be explored more in new erhu music? AZ: Personally I find myself really into the ornamentations of different regions in China for erhu repertoires. I think that represents the core part of erhu music. For contemporary works, I look for exploration with new techniques, the special usage of some of the ornaments and most importantly, can these techniques or ornaments help achieve the specific sound effect that the composers are looking for. When it comes to writting for Erhu, I wish to see different ornaments explored and used to composer’s own advantage. MR: Can you share a few of your favourite pieces for erhu?